"Lengthwise" is one of three songs on Rift (along with “FEFY” and “The Wedge”) that were recorded in the studio before they debuted live. It is also one of three songs (like “NO2” and “Catapult”) whose versions share essentially the same lyrics, but vary otherwise. 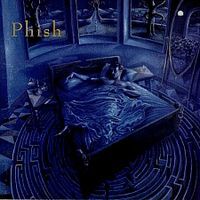 Even Rift has two versions of “Lengthwise.” In the first (track 3), Fishman’s simple refrain is accompanied by snoring and then interrupted by an alarm clock just prior to “Maze,” which begins the nightmare that is the album’s unifying concept. The second version (track 13, a third as long) comes as the narrator begins to stir from his sleep, and includes compressed snippets of other songs on the album. Live, too, everything but the lyrics is distinctive about each performance, including in particular the debut (with reggae instrumentation, revisited on 2/17/93), 2/4/93 (which ranged from reggae to rock, and had the refrain reprised during “Harry Hood”), 2/6/93 (“Faht”-like) and 6/9/09 (a cappella). And though the lyrics are few, Fishman has used them to ham things up, whether with additional lyrics about burning his hand (2/6/93, after refusing to tell The Prison Joke), an additional verse ("When you're there, I dream lightly / When you're gone, my head weighs heavy on my bed" on 12/6/92), as an insert in “Bike” (3/16/93), even for bringing out his mom to play vacuum (11/23/92 and 4/23/93). For a stretch in 1993, “Lengthwise” was often found opening a set, acting as a prelude of sorts to “Maze.” It is one of the few songs to appear in the show immediately following the show in which it debuted (emerging from “Terrapin” on 11/20/92). It was played nineteen more times during the next nine months, but only four times since then, making appearances on 10/20/94, in the middle of “It’s Ice” on 7/28/98, as the capstone of a four-song Fishman suite on 6/9/09 and reprising its role as set opening lead-in to "Maze" on 8/17/10. True "Lengthwise" connoisseurs may also want to seek out one of the versions of the song Mike performed with the Benevento/Russo Duo (check out 12/30/04 or 12/27/05).